When I venture to Sydney’s Cockle Bay in Darling Harbour to experience Nomanslanding, one of a number of public art projects around the country commemorating the centenary of the ANZAC campaign at Gallipoli, the weather is fittingly bleak and rainy, effectively buffering the touristic glitz of the area and applying a good measure of melancholy to this moving (literally and metaphorically) meditation on the ravages of war. An amazingly ambitious project, Nomanslanding is initiated by the Sydney Harbour Foreshore Authority in partnership with Glasgow Life and Urbane Künste Ruhr. 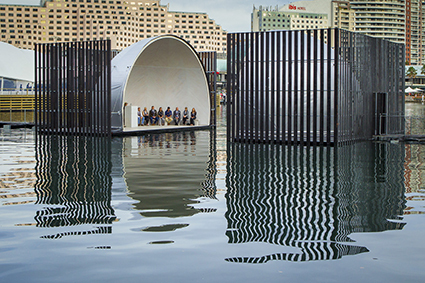 It has been created by an impressive collaborative team of artists each with significant experience in public and environmentally embedded art—Robyn Backen, Nigel Helyer and Jennifer Turpin from Australia, Graham Eatough from Scotland and Andre Dekker and the Observatorium team from the Netherlands. After its premiere in Sydney the work will find its way to the River Clyde for Glasgow’s Merchant City Festival in July and then to the harbour of Duisburg Ruhrort in Germany for the Ruhrtriennale Festival of Arts in August. Arriving for a 30-minute session, audiences can choose to enter from either end of the bay, effectively taking sides and becoming one of the red or blue squads. Briefing happens in an army tent where we are asked to sign off on a disclaimer that runs to around 20+ OH&S items (ah, the logistics of public art in Australia). We are then issued with nifty, compact life jackets and led across the bay on a bobbing walkway to a half-dome. Here we face the ‘enemy,’ the other squad in their half-dome, but we are separated by a watery gap. Sitting around the edges of the space we hear whispers skitter, seeming to emanate from alarmingly specific points, behind, above and opposite. It’s a collage of English and German—lists of personal items, fragments of letters, the voices of women left behind. Then sounds of war begin to escalate and the half-domes start to silently slide towards each other. After a cacophonic moment of warfare, the two halves seal as one and envelope us in darkness. We are given a few moments of silent contemplation before an achingly pure female voice is heard sounding like an amplified recording; but then a small (electric) lantern is lit to reveal a lone woman in white. She sings a haunting air—a beautiful melange of Celtic and European folk influences telling of rivers and tears and shores in several languages (lyrics by Graham Eatough, Andre Dekker, music in collaboration with Cora Schmeiser and Ben Fink). It is now that we really experience the magic of this structure. Near the centre of the space the acoustic properties of the dome amplify the singer remarkably, as if she’s miked. If she moves a metre either side, the intensity changes dramatically. If she goes to the edge of the space her voice slides over the roof, issuing forth from the opposite side. Finally her moving song sung and the official experience over, we are encouraged to stay and play with the acoustics of the space. Nomanslanding is a well-balanced public art experience: it offers a sense of gentle adventure in the physical navigation of the space; allows for wonder as we explore the installation’s seemingly magical properties; and gives time and space for contemplation on its themes of war and reconciliation. There is no denying the significant metaphorical power of the structure, however I did want a little more actual content once in the middle of the experience. The recorded soundscape in the dome is on the edge of ambient and feels constrained, almost as if afraid of lapsing into cliché. Or is it a tentativeness around the listening attention spans/tastes of audiences? However the experience really becomes charged when the live performance commences. Perhaps now that the monumental effort of construction and logistics is complete, the sonic and performative content of the work might be expanded. While the practices of certain artists with whom I am familiar are evident—Nigel Helyer’s sono-nautical explorations and Robyn Backen’s ongoing work with whisper domes—it is the cohesiveness of Nomanslanding’s large-scale vision that most impresses. It feels like a truly collaborative project drawing on the collective experience of the artists and curators to create a work that is far greater than any individual might have managed. This sense of collaboration adds tangible weight to the idea of reconciliation, forgiveness and reclamation, making Nomanslanding a significant and poignant public artwork. After my session I stand on the shore outside the IMAX and watch the structure open and close again. Two seagulls are hitching a ride, one on each half. As the dome comes together they indulge in some mutual grooming, a gentle intimacy I don’t associate with these greedy, squawking birds. The metaphoric power of Nomanslanding is strong indeed.